Reading labels on food and skincare is part of my daily life because there are many ingredients I either need to or chose to avoid. I want to impart some of my knowledge to readers because there are laws in place to protect consumer safety and a small number of cosmetic manufacturers are failing to comply. I currently have four products in my collection with labelling that does not meet the standards set out by The Cosmetic Products (Safety) Regulations 2008. (website link & PDF link). Obviously, government regulations are lengthy and complex but there are three labelling requirements which I wish to draw your attention to - INCI, allergens in essential oils and best before dates. You will see from the labels pictured above, these companies fail to comply with regulations because ingredients are listed in English and they should be in INCI (International Nomenclature of Cosmetic Ingredients). For example, water should be listed as Aqua, Jojoba oil as Simmondsia Chinensis (Jojoba) Seed Oil and Shea Butter as Butyrospermum Parkii. When an ingredient cannot be identified in this way then other classifications are used (chemical name, European Pharmacopoeia name, International Non-proprietary name (INN) as recommended by the World Health Organisation, EINECS, ELINCS or CAS identification reference or colour index number). As a side note, ingredients in concentrations of less than 1% may be listed in any order after those in concentrations of more than 1%. If a product is small or an odd shape and labelling it would prove tricky, then ingredients must be shown elsewhere, perhaps on an a leaflet, outer box or a tag. I approached the companies about lack of INCI and received the following responses. FYI when I shop for products I very rarely give indication that I am a blogger. I do this because I want my shopping experience to be authentic and do not wish to receive special treatment. "Yes we are in the process of updating all of our labelling to be in line with the new legislation. As a small family run business that has only recently started selling generally, we do not have the budget of large conglomerates so bare with us as we update the labels." "And so sorry for a wrong label, not sure how did I get it. I only can guess - As I design, print, cut my labels myself and I normally keep different designs on one product on one sheet of artwork." "Thanks for the heads up and many apologies, our labels have recently been changed to comply with INCI but an old version must have been stuck on your jar." Whilst I am willing to give companies the benefit of the doubt, isn't it funny how two of them practically came up with the same "excuse". The most alarming part to one response was "I was not aware that allergens for essential oils were a requirement for labels but we will definitely get on the case with that one!" From my own research via Google, I understand that on March 11, 2003, the EU published the 7th Amendment to its Cosmetic Directive 76/768/EEC. Among the changes was the addition of the 26 popular fragrance ingredients to the Annex III. In order to explain what that means for the consumer the following paragraph offers clarification. Fragrance allergens are identified at the end of the ingredient lists, you may be familiar with seeing components such as Linalool, Limonene, Geraniol (*further reading). One of the companies I contacted (quoted above) mentioned "new legislation". I can only assume they are referring to Cosmetic Regulation (EC) No 1223/2009, a new directive that came into force July 2013. Rather than bore you with further explanations of recent changes, the infographic below does the job for me. Two of the products I have in my possession were bought on the basis of reviews I had read. I can not say whether the labels were incorrect for those Bloggers. I love and support cottage industries but can not ignore failures to comply with the law. My most recent cosmetic purchase prompted me to write this blog post because they were the worst offenders. I spent £11 on a cleansing balm that I will not be using. Ingredients are listed in English, which I can forgive but the product contains essential oils and gives no indication of allergens. I worry because this product is from the company that informed me they were not aware allergens had to be listed on the label. As it stands, if the essential oils are above 0.01% (which I have no way of knowing) then this company is breaking the law by not declaring them. Effort has been made to include for a "best before" date as there is a space on label but it hasn't been written in so I have no idea of minimum durability or period for which product is safe after opening. I also spotted lack of a batch code which is required under Regulation 12(1)(d). As a customer with sensitive skin, the risk of allergic reaction is too high. Countries outside of the EU will comply with different regulations laid out by their governing bodies, however, if they intend to sell to Europe they would be expected to comply with EU laws. If you are not happy with a cosmetic label, I would challenge the company that manufactured the product. If the answer you receive is not satisfactory, you would be within your rights to report your concerns to Trading Standards. I know this is a lot of information to digest but I am curious, how many of you were aware of the regulations? Are you checking labels in the same way I do? If you find incorrect labels do you raise your concerns with the manufacturer? I find that the worse ones for labels are things that I buy from the US...obviously they don't have to comply to EU law, so always have to be extra cautious. I do have one product I'm aware of where the ingredients are listed INCI, but lots of misspelling which I can overlook, but might mention to them on my next purchase. Anyway, great post and very, very informative. I'm now going to my bathroom to check everything haha. Whilst researching for this post, I picked up from The Cosmetic, Toiletry & Perfumery Association (CTPA) that it is enforced by local Trading Standards Officers (TSOs). The person who makes the product must notify the Department for Business Innovation and Skills (BIS) - http://www.bis.gov.uk/ before selling. There is certainly a level of honesty required by looks of it, the system is not without its flaws. It's good to hear though that they changed the regulations in July 2013 as I do think it needs to be regulated as you're putting it onto your skin - they should know the law! It's very easy for anyone to start a skin care company, i'm sure you or I could easily start making products in our kitchens. The difficult bit is ensuring they're meeting legislation. That said, it's no excuse! You wouldn't open a restaurant without the relevant papers and food hygiene standards in place. If a business is going to do something, it should do it properly and with integrity. To be honest I quite welcome brands who use English, as well as the INCI, in their labelling. However you can't just NOT include the INCI! Andy, I agree with you and you raise valid points. I like English on labels (alongside INCI), makes it easier for me to spot my allergens, instead of trying to remember all the INCI names. Organic labelling is a whole other saga in itself , such a minefield to work your way around. I'm pleased to hear that you tackle this one head on and question companies about their ingredients, however, it would be a lot easier if companies were just upfront about things. Website that lack decent information drive me crazy. Interesting read, and interesting comments. Although I do sympathise with the smaller producers and the variety of hoops that need to be jumped through to sell handmade/homegrown/artisan cosmetics, it is worth noting that there are a large number of producers and companies in similar positions that did manage to comply and also made sure that their customers were aware of the changes to their labelling (one of my fave brands Akamuti springs to mind). Also, although the Regulation (which consolidates, repeals and replaces the previous Directive) came fully into force on 11 July 2013, you can see from the citation that it was actually enacted back in November 2009 - some three and a bit years before full compliance was required, which is done in order to allow those affected to get their s...tuff together. So, if there have been mistakes and mislabeling I can understand that - but having no knowledge of is something I find difficult to believe. And unfortunately, when you get into the legalities, ignorance is no defence! Hit the nail on the head there, where INCI is concerned that's not a new directive, that has been in place for years, so the companies I have spoken to are making excuses, even if they did stick an old label on a jar, I would still expect ingredients to have been in INCI. Oh, absolutely re INCI - that's not new in the slighest! And to answer your questions - I was aware of the regulations in part because of my interaction with brands in the Twittersphere and in part due to my studies. I do check labels, but like Annie I don't have any allergies that I'm aware of with regard to fragrance for example, so I'm not as vigilant as I could be. Lastly, I haven't often spotted errors, but when I do, I contact the company. (Most recently it was regarding something labelled as vegan but containing carmine). I know very little about regulations but I'm shocked to see some companies aren't clued up either. Surely if you were about to start up your own skin care line you would look into all this stuff first. This is pretty shocking. I actually saw a picture yesterday on my facebook, an ingredient label only listed a few ingredients and then said "and so on" . Unbelievable! What kind of labels should be on alpha cyanoacrylate(fingernail glue)? Should it carry any warning symbols and should it have the actual address of the supplier/manufacturer on it? Any help would be much appreciated. My daughter has second degree burns from this product and i'm sure I shouldn't have even been sold it in the first place :( It was from a UK trader on ebay. Sorry to hear about your daughter's experience. 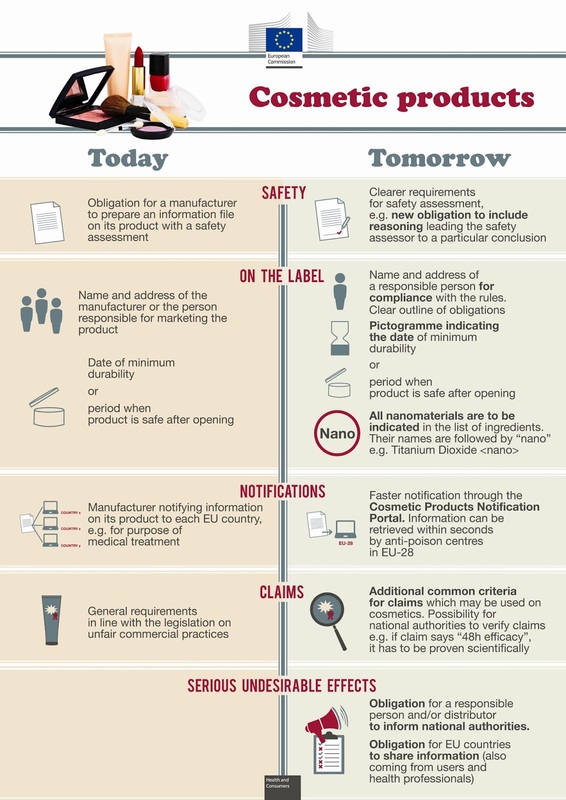 The regulations outlined above cover products manufactured in the EU. Unfortunately there is no way of knowing where the seller is getting the product from, it may even be a fake. I would recommend you report the situation to Trading Standards. I would hazard a guess that this situation breaks a number of serious regulations not just the ones that were highlighted in this blog post. You can find your local TS office via Google and email or call in your complaint. Thank you Sarah for highlighting the illegal labelling of some small fledgling skincare companies. I used to sell at craft markets, and was often amazed at homemade beauty stalls that sold products without labels. I would pluck up courage and go and tell them (politely!) and point them in the direction of a course teaching cosmetic legislation. It is often ignorance, but that doesn't make it excusable. As a skincare producer, I must say the EU legislation has been a headache. But at the end of the day, it is there to protect the consumer. As a consumer I do appreciate the efforts brands such as yours go to in order to comply with regs. I'm self educated on the topic so if I can get the general gist of the regs then I really don't understand how brands can give lame excuses for getting it wrong. Surely a law suit is more frightening than doing research when setting up shop.